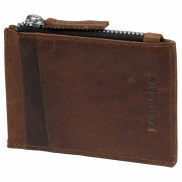 Carry your cash, cards and other essentials in style with our great selection of high-quality wallets and cardholders. We've got something for everyone, from slim leather cardholders to full-size wallets in a variety of designs and colors. Here you'll find all our men's cardholders and wallets. The leather wallet is the classic men's wallet for carrying bills, credit cards, IDs, driver's licenses and loose change. We also have cardholders that are smaller but still quite practical on their own. Cardholders are ideal totes for business or credit cards and come in a variety of capacities. Wallets carry more than cardholders, and we've got them in various sizes, color schemes and designs to ensure you find the right one for you. Leather is slightly expandable, meaning that each card slot can accommodate more than one card. Just be aware that overstuffing will cause the leather to loosen. At Trendhim, the vast majority of wallets are made from 100% cowhide leather. We use top grain leather for most models, because only that kind of quality gives you the handsomely rugged, authentic leather look and feel we all love so much. Full grain leather wallets age incredibly well, becoming softer and darker with use. Some of the models we carry are made from split leather. Although it doesn't look and feel the same as top grain leather, it's still pure cowhide and wears well. A card holder is a small practical tote that measures about 3 15/16" x 2 3/8" — compact enough to fit into a shirt pocket. We carry both classic leather and fancy steel models. Leather cardholders boast a larger capacity thanks to the material's natural flexibility. Steel cardholders certainly protect cards better, but are usually limited to 5 or 6 cards only.